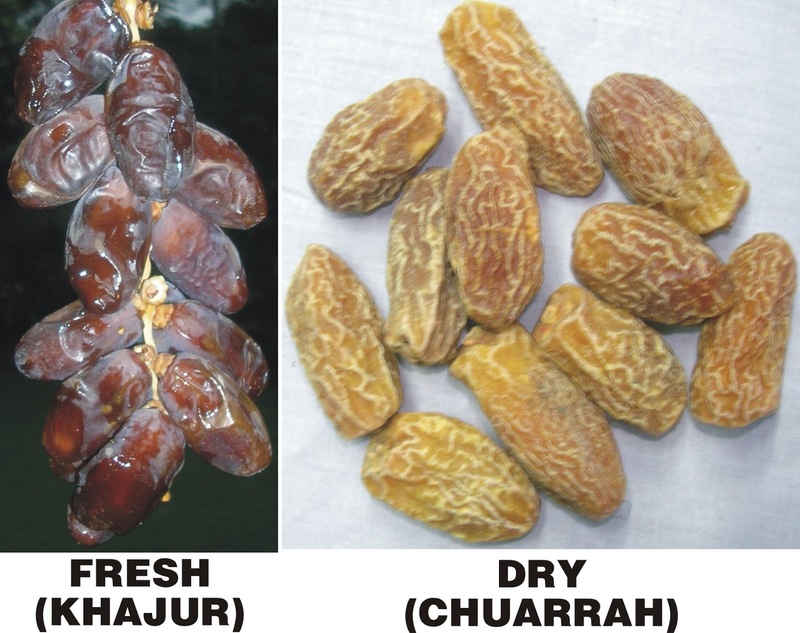 KHAJUR is very important fruit in Middle East countries and Asia. Its dry and ripe both form can be used. Its botanical name is Phoenix Dactylifera. There are two types of KHAJUR i.e. KHAJUR and Pind KHAJUR. Pind KHAJUR is more pulpy and big compared to normal KHAJUR. When it becomes dry it is called as Chuara. It is the healthy nut. The fresh juice of KHAJUR is called as Nira while other is known as Tadi. KHAJUR have lot of iron and fluorine. It also contains vitamins and minerals. It has vitamin B1, B2, B3, B5, A1 and C. It does not contain cholesterol. It has very low fat. KHAJURs have high potassium and less sodium. It is very useful for nervous system. KHAJUR reduces the LDL cholesterol level in the body. It strengthens your heart. You can put KHAJUR’s antimony in your eyes. It relives your eye pain. KHAJUR increase your vision and gives relief in night blindness. KHAJUR is very fruitful for pregnant women. It gives firmness to uterus. You can soak KHAJUR in water at night. Intake this KHAJUR in the morning as it is very useful in constipation. Keep KHAJUR in goat milk overnight. Grind it in the morning and add cinnamon power and honey in it. This mixture should be use by such women who do not get conception. Take fresh water and rub the KHAJUR it in it. Make a fresh juice of it. It reduces the side effects of alcohol. It strengthens your liver. You can give KHAJUR mix with honey to small children. You can also intake KHAJUR with cow’s ghee. When you do not get appetite then you can intake chutney of KHAJUR and lemon. If your Mars is weak then your physical strength decreases. You cannot concentrate. In this case, you can intake KHAJUR along with milk at night. It strengthens your Mars. When your Saturn is weak then you’ll have pain in your legs. You face losses in your business and struggle increases in your life. In this case, you must donate 5 KHAJURs every day.